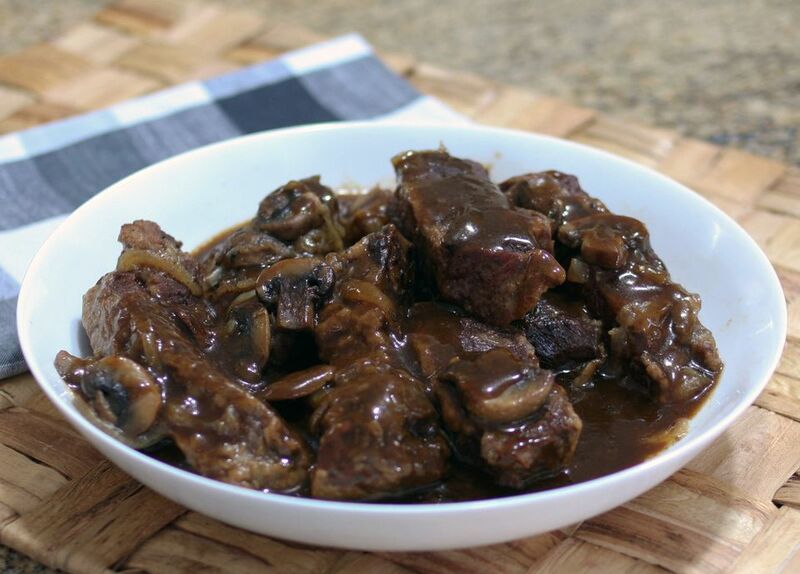 These tender, melt-in-your-mouth beef short ribs are served with the delicious gravy for a fabulous meal. Serve with mashed potatoes and your favorite vegetables, or serve them with hot cooked noodles or rice. Make this dish with boneless or meaty bone-in short ribs. Or make the dish with a lean chuck roast, cut into chunks or cubed. If you use short ribs on the bone, allow about 1 pound per person, depending on how meaty they are. Trim excess fat from the short ribs. Combine the flour, salt, and freshly ground black pepper in a food storage bag or a wide shallow plate. Mix well. Shake or dredge the beef pieces with the flour mixture. Heat the olive oil in a large skillet over medium-high heat. When the oil is hot, add the floured beef short ribs and cook for about 6 to 8 minutes, turning to brown all sides. Transfer the ribs to the slow cooker. Add the onion and mushrooms to the skillet and cook, stirring, for 3 minutes, or until onions are softened. Add the wine and scrape up browned bits. Continue cooking, stirring, for about 2 more minutes, until the wine is reduced by half. Add the beef broth, vinegar, brown sugar, and garlic. Bring to a boil and cook, stirring, for about 1 minute. Pour the wine and broth mixture over the ribs in the slow cooker. Cover and cook on LOW for 7 to 9 hours, or until the beef is very tender. Remove the beef and vegetables to a platter and keep warm. Put all of the liquids in a gravy separator or skim to remove excess fat. Put skimmed liquids in a saucepan and bring to a boil. Continue boiling, stirring, for 5 minutes, until reduced by about one-third. Combine the cornstarch with about 2 tablespoons of cold water. Whisk the cornstarch mixture into the liquids and continue cooking, stirring, until thickened. Serve the short ribs with the gravy.